"Such a good bike for the money." – Steve M.
Shhhh. What was that? Ajax moves through the city with stealth and speed, an urban ninja in matte black. Wired magazine bestowed Ajax with their "Gear of the Year" award and called it their “favorite urban velocipede we tested this year;” lofty praise from the oracles of innovation. At the heart of this bike’s performance is its new-school drivetrain: an eight-speed Alfine internal hub and super-smooth belt drive that slices through the city like a shinobi in the night. A favorite of tech-heads and entrepreneurs from Palo Alto to Brooklyn, Ajax delivers across the metrics that matter: performance, engineering, and — with many of the same high-end features as our Acme — it's also a great value. (We know that even urban ninjas need to complete their missions on a budget.) And like all of our street bikes, Ajax has hard mounts for racks, fenders, and a kickstand. Super-high quality with simple shifting and low maintenance providing a 307% gear range. 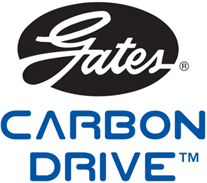 Rider Height 4'10" - 5'8"
Fork Spot Carbon Disc w/ carbon tapered steerer, 1-1/8" - 1-1/2"
Gates Carbon Drive is the high-tech belt drive offering for bicycles. Interested in key parameters of your drive like speed ratio or center distance? Want to know what belt lengths or sprocket sizes will fit your ride? What about comparing one bike to another to tweak your ratio perfectly? With our calculator and catalog, you can stay on top of the perfect setup for your drive.